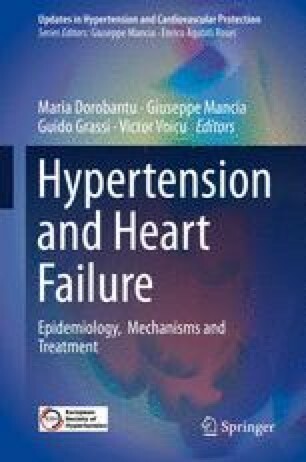 This chapter focuses on the prevention of heart failure by antihypertensive treatment and treatment of people with hypertension and an established heart failure. On the former issue, the chapter emphasizes that blood pressure-lowering interventions majorly reduce the risk of incipient heart failure, the degree of benefit being similar or even greater than other major benefits associated with a blood pressure reduction, such as prevention of cerebrovascular events. It further emphasizes that the prevention of heart failure by antihypertensive treatment is largely due to blood pressure lowering per se, i.e. regardless of the drug employed, although some differences between drugs (greater and lesser incipient heart failure reduction by diuretics and calcium channel blockers, respectively) may exist. On the latter issue, the chapter reviews the evolving position of guidelines on how to treat patients in whom heart failure is accompanied by uncontrolled blood pressure values. Mention is made of the blockers of the renin-angiotensin system (ACE inhibitors and angiotensin receptor antagonists) and loop diuretics as the preferred drugs together with antialdosterone agents, beta-blockers and calcium channel blockers, the last drugs needed to control angina. It is further mentioned that treatment aimed at reducing blood pressure (1) should start at systolic blood pressure values equal or above 140 mmHg and (2) a target blood pressure can hardly be identified because in heart failure the need to use life-saving and symptomatic drugs that also lower blood pressure may require their administration throughout a wide range of values.